Having a bright, white smile can boost self-confidence, especially with any upcoming social gatherings and events. At Meadowvale Dental Centre, we provide professional teeth whitening treatments to lift stains from the smile. If you’re considering a cosmetic enhancement and want to learn more about teeth whitening, contact our Mississauga dental practice today. A discolored and stained smile can make many patients feel self-conscious. Whitening is a simple and efficient way to improve self-esteem. Stains develop for a variety of reasons. Over time, consuming darkly-pigmented food and drinks such as wine and coffee can turn the smile yellow. Dental trauma and overall wear, especially for seniors, can create discoloration difficult to lift. 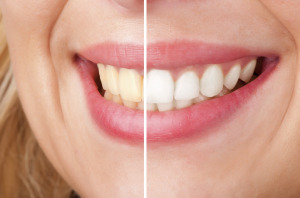 With the variety of over-the-counter options available to bleach the smile, it’s important to consider the benefits of visiting a dentist instead. At Meadowvale Dental Centre, teeth whitening is a popular cosmetic dental treatment that can enhance the smile without an invasive procedure. We provide customized bleaching options to ensure all our patients, especially those with hectic schedules, can feel confident. Our practice offers both in-office and take-home whitening systems, keeping your personal comfort and smile goals in mind. For a brand new smile in just one appointment, we offer teeth bleaching services in our office. We provide the Iveri chairside system that utilizes light technology to enhance bleaching agents and eliminates difficult stains. To obtain this treatment, patients first complete an oral exam to diagnose any existing dental issues such as cavities prior to bleaching. Non-custom trays and over-the-counter treatment do not protect your gums from discomfort caused by the whitening gel. At our office, we apply vitamin E oil to the gums before applying the custom tray and whitening solution. In just one visit, patients experience noticeable results and can attend important events and meetings with confidence that their smile is stunning. For patients who prefer to brighten their smile at their own pace, we provide teeth whitening services for at-home use. Similar to our in-office treatments, take-home kits include a customized tray that allows the bleaching agent to make full contact with the contours of your teeth. At Meadowvale Dental Centre, our team of dentists and staff are committed to providing comfortable treatments that enhance the health and beauty of your smile. We offer free teeth whitening with every new patient exam and cleaning. For more information about individualized teeth bleaching services, contact our practice to schedule a visit today!